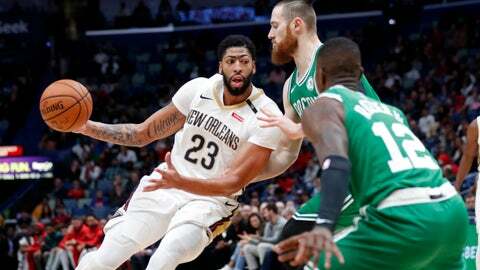 NEW ORLEANS (AP) — Anthony Davis had just trimmed New Orleans’ deficit to a seemingly surmountable seven points when Boston’s Kyrie Irving and Jayson Tatum combined to quickly squash any notion of a comeback. Tatum, who scored 20, threw down a right-handed dunk while being fouled by Davis with 2:26 left, at which point Pelicans coach Alvin Gentry began subbing out starters and fans started filing out, resigned to just New Orleans’ second loss in 10 home games this season. “It’s closing time at that point,” Irving said. “We knew that we had the game in control just based upon our defensive schemes that we had out there. “At winning time like that, I have the confidence in my teammates and confidence in my coaching staff to make the right plays and seek out the mismatches that we want,” Irving added. Irving had five steals, while Tatum and Horford each had three. The Celtics put up 39 3s, hitting 19, a statistic that Gentry thought was as telling as his team’s turnovers. Celtics: Terry Rozier scored 14 points. He also was assessed a technical foul in the second quarter after he tossed the ball away during a stoppage. … Boston outscored New Orleans 42-34 in the paint. … The Celtics improved to 6-7 on the road. Pelicans: Jrue Holiday scored 13 points but also finished with eight turnovers. … Forward Solomon Hill saw action for the first time since Nov. 1. He saw no playing time in 12 straight games before his 20 minutes against Boston. He had four rebounds, two points and an assist. … New Orleans was 27 of 29 on three throws, but went 12 of 32 from 3. New Orleans trailed nearly the entire game, falling behind early because of eight first-quarter turnovers that led to 11 Celtics points. Holiday, playing point guard instead of shooting guard while Elfrid Payton sits out with a broken finger, turned ball over five times in the opening period. Rozier’s layup capped the burst and made it 80-60 midway through the third quarter. Soon after, Randle’s free throws and Darius Miller’s 3 ignited an 11-2 Pelicans run to close the period, trimming Boston’s lead to 10 heading to the fourth.